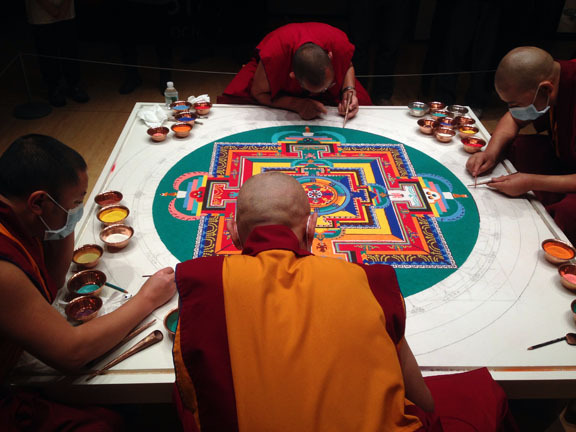 I visited the Asia Society on my lunch hour where four Tibetan Buddhist monks are creating a mandala. It’s a rare treat. 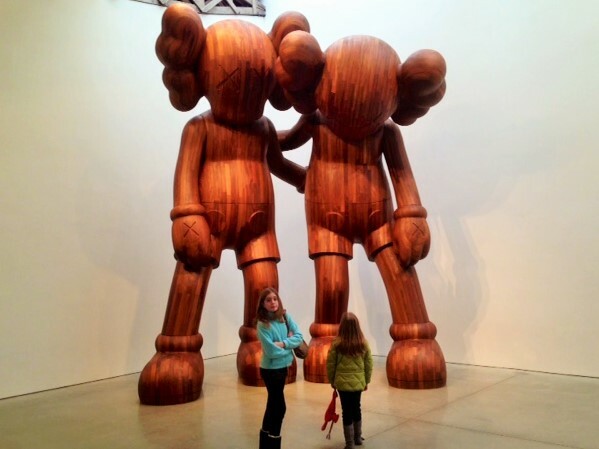 I’ve only seen one other before; created in the lobby of the World Trade Center many years ago. Do you guys know what a mandala is? That’s all SAND, friends. 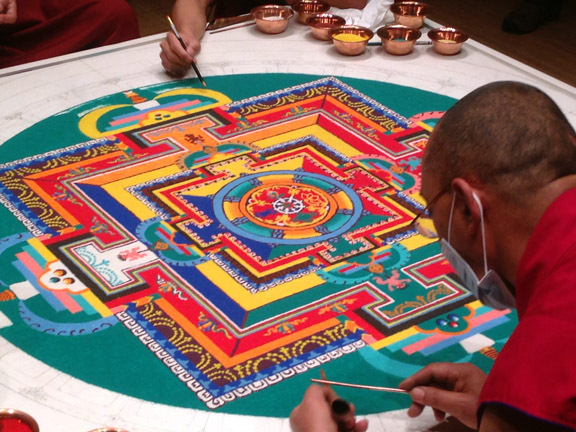 A mandala is a beautiful, painstaking, time consuming, spiritual work of art. 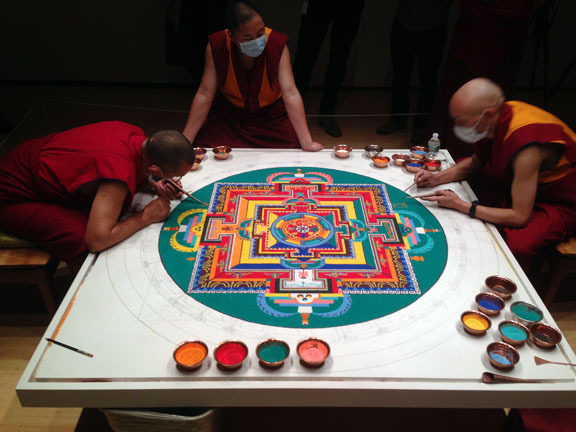 It’s being created in conjunction with The Asia Society’s current exhibit, Golden Visions of Densatil: A Tibetan Buddhist Monastery. The monastery was destroyed in the 20th Century and its reliefs and sculptures scattered to the wind. 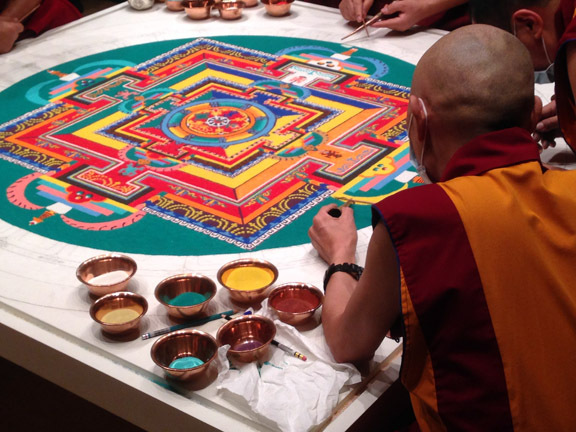 As Holland Cotter of The New York Times wrote in his exhibit review, “You have to hate or fear something a lot to do what China did to Tibetan Buddhism.” The pieces are now being gathered and the Monastery restored. They’re on display until May. 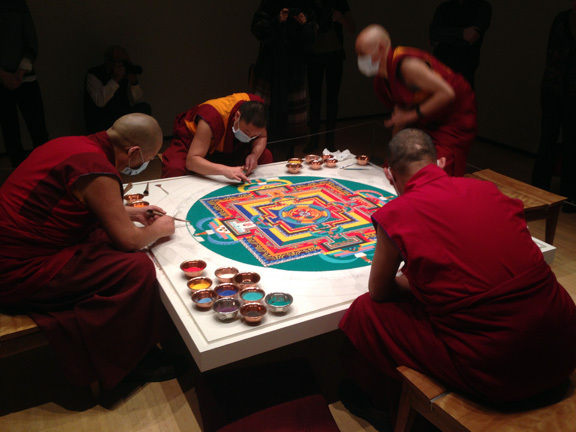 They started the mandala on Thursday and it was scheduled for completion on Sunday. A pattern is designed and draw in pencil. You can still see some of the outlines along the perimeter. Colored sand in copper bowls is poured into copper funnels tapered to fine point. The monks tap or scrape the funnels with copper rods and the sand slowly pours out in small increments. 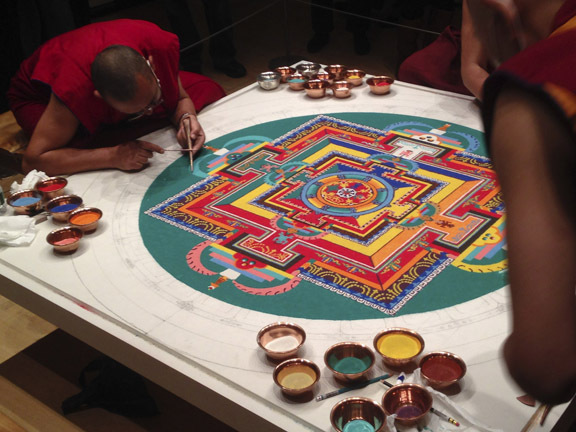 The mandala will remain on view through May until the exhibit closes. 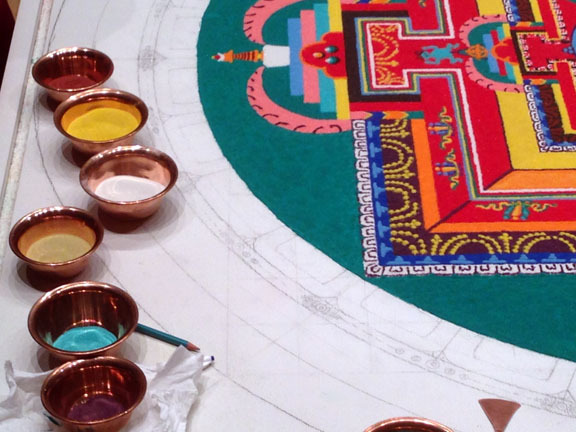 Do you know what they do with a mandala once it’s completed? A ceremony is performed and the monks who created it take a broom and sweep it away. After all that hard work! It’s a meditative lesson on life’s impermanence. Everything changes, brothers and sisters. Nothing lasts forever. Trying to hold onto something, be it a shiny bauble, your fading youth or someone in your life, is an exercise in futility that will only lead to an unsettled and agitated mind. The sooner we learn to LET GO of things, the happier we’ll all be. Reet? You are permitted to stand along the perimeter and observe. The room is dim and a quiet respect fills the air. The monks talk amongst themselves in low tones and will occasionally chuckle over a private joke. They work seven hours a day. Their philosophy is the closest thing I’ve ever come to being moved spiritually. I sat in Catholic churches and parochial schools all throughout my youth. I was never touched and, more often that not, was just bored. These are not negative judgments I’m espousing. Just my own personal experiences. My mother was saved by the Catholic church. She died peacefully because of her deep faith. She was always sad that I didn’t embrace the church’s teachings, but what am I to do? You can’t manufacture enthusiasm. It’s either there or it isn’t. 7-Year Old Daughter had her first Holy Confession last week. It’s one of the seven sacraments you can receive in the Catlick church. In confession, you sit with a priest, one-on-one, and confess your sins. Afterwards, you are given penance, usually a series of prayers to recite. It’s cathartic for a lot of people. “I’m addressing just the children. What a heavy trip to lay on an innocent 7-year old! Always the beat-down. This is the oldest trick in the book. In the military they do it in boot camp. In fraternities it’s called hazing. It’s at the core of most theologies. You’re torn down, made to feel lowly and unworthy, and then rebuilt. You feel grateful towards your tormentors—the very people who damned you!—for making you feel whole again. I should take her to a monastery and save her from all this wrath.